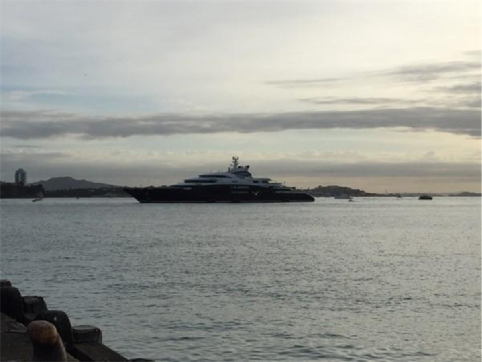 One of the world's biggest superyachts, the 134-metre Serene, arrived in Auckland in the early morning of January 20 to the surprise and delight of early bird wharf strollers. The vessel was built by Italian shipyard Fincantieri and delivered to owner Russian vodka tycoon Yuri Schefler in August 2011. Serene is longer than a rugby field and the largest such vessel ever to visit New Zealand. attracting intense interest during her stay in New Zealand last summer. challenges finding space for the 8,200-gross-tonne vessel, which makes a splash wherever she arrives around the world. The article included details from yacht charter websites showing the vessel has a helicopter hangar, two helipads and a submarine hangar. There is an underwater viewing space and 12 luxurious staterooms for 24 guests who are tended by up to 52 crew. The owner's suite boasts an exterior hot tub on its terrace. This stateroom has a centred oversize California king bed, full walk-in dressing area and spacious ensuite bathroom. It has its own lift that links to a "sea cabin" on deck two, with a private swim platform. Behind the owner's suite are a saloon, lounge bar and library with a fireplace. There's an internal seawater swimming pool, a hot and a cold Jacuzzi plus jet stream swimming pool on the sundeck. The vessel – more than three times as long as Fuller's biggest ferry in Auckland - also has a cinema, a library and an indoor climbing wall for kids. Gates reportedly spent US5 million per week to charter Serene. Regarding the superyacht‟s visit, Tobin believes it will generate financial benefits for New Zealand. “Spending by the party and crew during the visit will be huge – into the millions of dollars,” she says. “It is likely to cruise around the coast, but will be spending some time in Auckland. Other superyacht owners who visit enjoy the relaxed lifestyle and quintessentially Kiwi pastimes such as hunting and fishing.”Offering concierge services to superyachts for the past 12 years, Tobin has observed that “the tourism side of the business has boomed in the past year”.